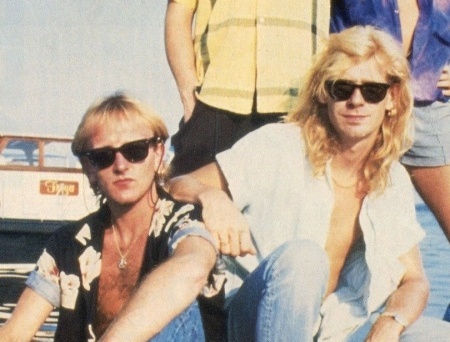 Def Leppard guitarist Phil Collen was interviewed ahead of the 2017 tour and mentioned the late Steve Clark. Phil spoke to Ken Sharp for Rock Cellar Magazine. Phil talked about the first live concert he attended, the band's longevity, Def Leppard songs he'd like to play live, joining the band in 1982, his 2014 guest appearance with KISS, memories of Steve Clark, band working relationship/friendship, Mutt Lange, Tesla and Delta Deep. Phil says that Delta Deep have up to eight songs ready for their second studio album. He also recalled his on stage guest appearance with KISS in Atlantic City, NJ during the Summer Tour 2014. The magazine are giving away concert tickets and Meet And Greet passes for the upcoming 2017 tour. "I just miss him terribly as a person. This is weird; we could sit down and have an eight-hour conversation. He was my best friend. That’s kind of weird; I don’t know any other guys who I could sit down with and have a chat for eight hours and get into a deep philosophical conversation. Plus we were in the same band, so we were having all these same experiences." "Def Leppard is a family. We’ve spent more time together than with any blood relative we’ve ever had; my parents included. You spend 16, 18 years with your folks, we’ve been doing this constantly for 30 something years so you get to know each other intimately. It’s the same thing as any kind of friendship or family thing. It changes and goes on."